This Hawaiian Tree Snail is the size of the palm of my hand. Tom thought it was a decorative item. We found this photo online which better illustrates the size of this snail. This boat takes tourists out for various adventures. Life happens as it happens and we prefer to post each morning immediately after we've written a new post. As a result, today, you'll see two posts. Going forward you'll see a new post each day. You can continue to read each morning to see a new post from the prior morning. By posting twice on October 17th, it enables us to avoid missing one day's post as we strive to maintain continuity. Tom walked toward our private beach near the breakwaters. We apologize for the inconvenience but we've found it better to post in "real time" as opposed to 24 hours before it is seen. The news will be newer, the events more relevant time wise. Thank you for your understanding. The post you saw this morning was written last night on Thursday. As I write this now it's early Friday morning. Not much has transpired since last night other than at 9:30 pm we hunkered down to watch an episode of Hell's Kitchen on my laptop. Perhaps boring to some but, it was fun for us! The beach for our building only. As nice as this is, we prefer to sun and fun by the pool. Finally falling on our faces we headed to bed after 11. Oddly, the bedroom has no AC and the single unit in the living room is too far away to have any impact on cooling the bedroom. With the threat of Hurricane Ana still looming, supposedly heading our way tonight or tomorrow, the air is thick with heat and humidity. We anticipated that sleeping would be difficult after 77 nights in AC comfort. In Madeira, the last vacation house in which we lived, the temperature rarely was higher than 75F, 24C during the day cooling down considerably at night. With Maui daytime temperatures as high as 88F, 31C, it was still 79F, 26C when we went to bed, leaving us anticipating a fitful night. Awakening this morning, I was impatient to get up and get the day going. First things first, I turned on the burner for the whistling teapot, an item I drooled over when we first walked inside the condo. I haven't had a real teapot to use for so long I can't remember. We know we should be drinking Kona coffee while in Hawaii but with Tom cutting out sugar, starch and carbs as of today, he has no interest in coffee without two spoons of sugar per cup. Views from the private beach. In support of him, I won't drink coffee as he's supported me in my diligent observance of this way of eating. Tea is a fine substitute for me. Of course, when family arrives for Christmas, we'll certainly have Kona coffee available. (I doubt Tom will stick with the plan over the holidays and will join in on the Kona coffee). As we roamed the grounds at our building, we spotted this warning sign. I couldn't get the washer going fast enough. With only enough dirty laundry for one load, I was excited to use the stackable washer and dryer in the unit. We haven't had a dryer in a vacation home since November 2013 in Scottsdale, Arizona as we busily prepared to leave the US. In a little over 75 minutes the laundry was washed, dried and put away. How wonderful! Ah, the simple things. They mean so much. The surf outside our door. As for Hurricane Ana, some of the news people are still calling her Tropical Storm Ana while others say Hurricane Ana. Her winds are a 70 MPH, heading our way. Once it hit 75 MPH which is expected today, she will officially be called Hurricane Ana. She has yet to hit the Big Island, her first target in the chain of islands. 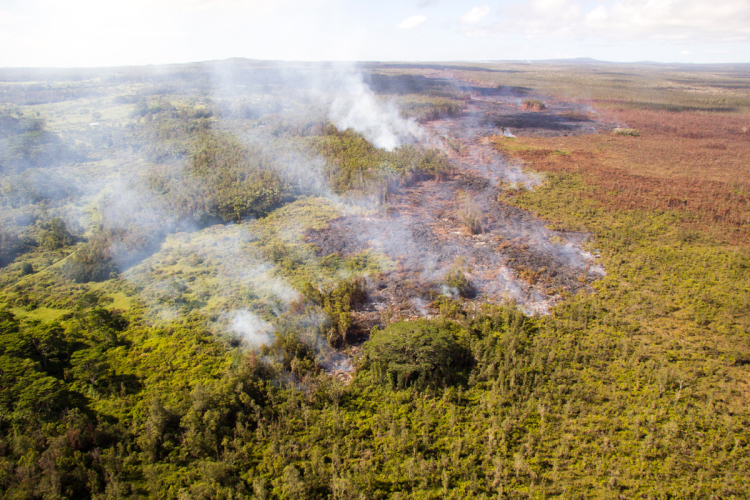 The lava flow is currently 150 yards wide heading toward Pahoa, where we'll live beginning December 1st. Helicopter operations to view the flow have been suspending do to Ana. There's always the good and the bad, the yin and the yang and the ups and downs in life. Hawaii is no different in that manner than anyplace else in the world. We chose to spend this period of time on these lush tropical islands. With that comes a price to pay, as is the case with almost everything in life. Happily, we pay that price, hoping in the long haul, the benefits outweigh the worrisome aspects. We'll continue to stay in touch sharing what we discover along the way. In today's earlier post we included a photo for this date. With the above described readjustment of uploading time, we included another photo from that date. For details of that post, please click here. The chef at Camp Olonana made every effort to prepare delicious well seasoned meals for me. He succeeded beyond expectations. For details from that day's post, please click here.